The Community Plan focuses on future impacts and future conditions within Dublin. Estimating traffic in future years was accomplished through a computer model (Cube/Voyager) that estimates traveler characteristics, quantified using information from MORPC and survey and land use data from Dublin, to project when and where vehicles will travel. The study area for projections is subdivided into smaller geographic areas called Traffic Analysis Zones (TAZ). Using land use densities for the anticipated future land use, residential population and employment information are calculated for each TAZ, which then determines the number of trips to be assigned to the roadway network. Travel demand modeling is traditionally a four-step process: 1) trip generation; 2) trip distribution; 3) mode choice (method of travel, e.g. transit, personal vehicle, etc. ); and 4) trip assignment. The Transportation Planning Handbook, Second Edition, published by the Institute of Transportation Engineers, generally describes each of these steps. Trip generation: predicts the number of person trip ends (travel to and travel from) to each defined zone in a study area. Trip distribution: connects trip ends estimated in the trip generation to determine travel between TAZs. Mode choice: determines the method of transportation that will be used to travel on between each TAZ. Trip assignment: assigns trips to specific highway or transit routes and determines the resulting highway volumes and transit ridership. As noted above, the travel demand model includes land use data for each Traffic Analysis Zone (TAZ), which is then tested against future conditions. For Dublin, the land use information for each zone is based on the development scenario used to create the Future Land Use Map. Using vehicle trips projected for Dublin’s development in approximately 20 years, the highway network is adjusted by adding or reducing lanes until the network functions appropriately. The updated transportation demand model is the basis for the Thoroughfare Plan, which represents the road network necessary to address the community’s 2035 mobility needs. The Thoroughfare Plan also indicates the number of lanes needed to accommodate expected traffic levels in 2035. The initial transportation modeling effort undertaken for the 2007 Community Plan update included a year 2030 planning horizon. The 2030 testing was done to coincide with the fiscal analysis and yielded important information on phasing considerations and costs associated with the required network improvements. 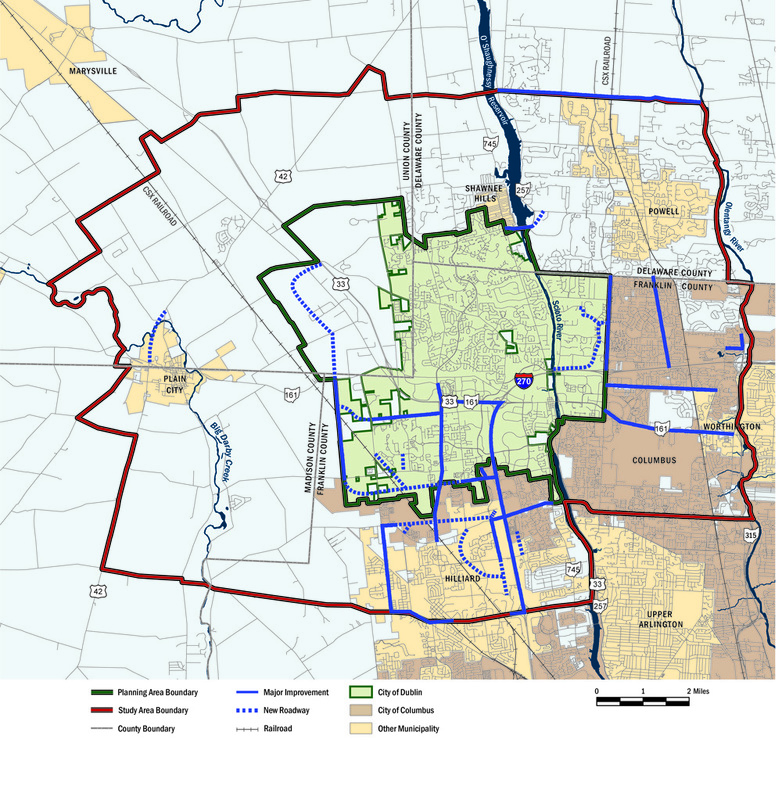 The model was updated in 2012 to incorporate MORPC’s new 2035 horizon year and adjustments to Dublin’s Future Land Use Plan based on the Bridge Street District and West Innovation District planning efforts. Separate transportation and fiscal analyses have been undertaken for the Bridge Street District to provide additional guidance for phasing of street network improvements in this area. Focusing on year 2035 levels was necessary to ensure consistency with the planning efforts of other transportation agencies, including MORPC and ODOT, as the region’s future transportation projects originate in planning and programming documents assembled by these two agencies. Using a 2035 horizon year and significant network analysis provides Dublin an advantage in pursuing federal and state funding for future projects. The components of the future network include a listing of projects recommended to address congestion in the Dublin area through 2035. Due to the modest pace of development within the study area related to economic conditions over the past five years, many of the improvements originally identified as necessary by the 2007 Plan’s horizon year of 2030 have been extended to the new horizon year. During the 2007 Plan update, a policy determination was made as part of the planning process to limit the maximum number of through lanes to two in each direction for Dublin collectors and arterials. This policy balances roadway capacity with aesthetics, pedestrian orientation, and other quality of life considerations. Thus, as travel demand increases, some corridors may be challenged to achieve acceptable levels of operation. For instance, in the case of Dublin Road, the corridor will remain constrained as a two-lane roadway regardless of how congested it becomes. As such, motorists will have to choose whether to remain on Dublin Road or select an alternate route. Dublin’s overall system is comprehensive and robust and provides many alternate routes for most trip origins and destinations. Some congested corridors will remain in 2035. The Avery-Muirfield Drive corridor, Dublin Road, and U.S. 33/SR 161 (inside I-270) will continue to experience congestion during peak hours and additional traffic operational enhancements must be considered. Given Dublin’s growth areas to the west, roadways on the periphery of the city and other important segments were sized by number of lanes with consideration of the full build-out impacts of these changing areas. Land use considerations for the full build-out of Dublin will require future analysis of and improvements to the Dublin transportation system. Previous travel demand modeling used the roadway network in the 1999 Thoroughfare Plan. Since this original network was found to be inadequate to handle the traffic associated with year 2030 development, it was enhanced by adding lanes to certain roadway segments. 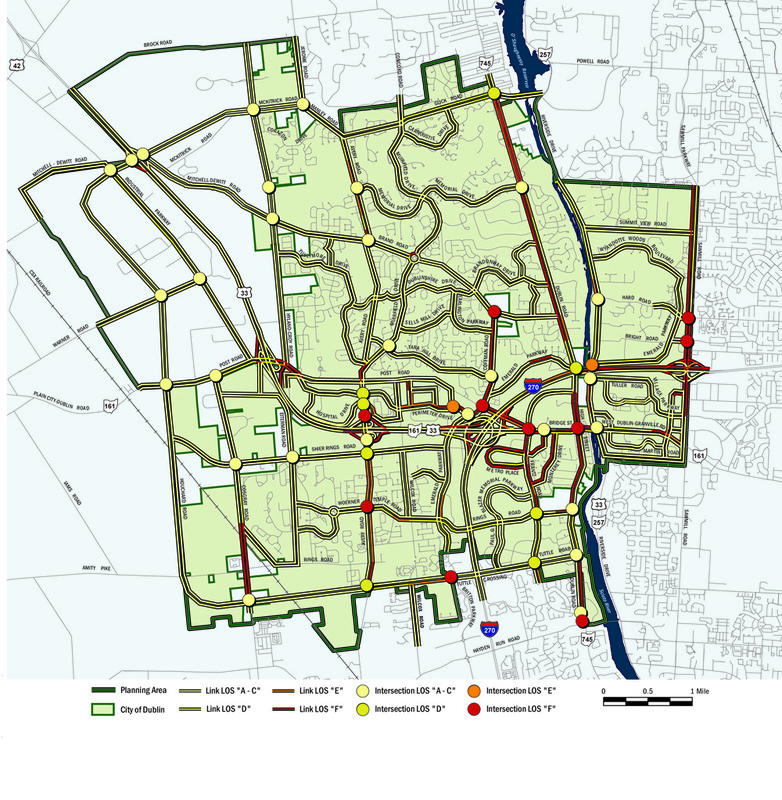 The planning process for these improvements included community input and respected community sentiments to limit road widening to acceptable widths. In this sense, it represents the maximum feasible network. 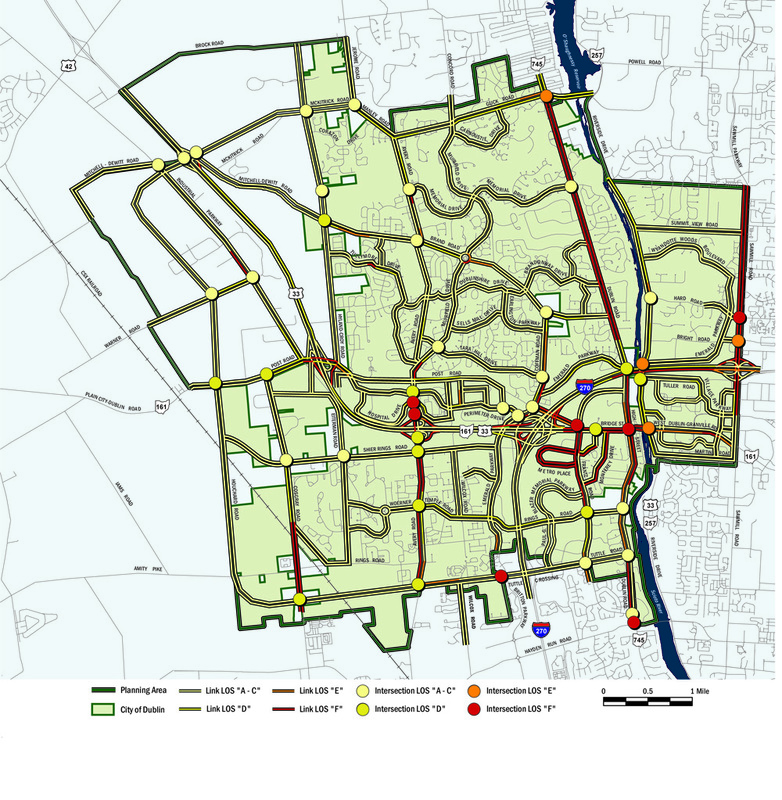 Adjustments were also made to consider transportation plans of adjacent municipalities; the network was modified to recognize and coordinate with planning efforts of Union, Delaware, and Franklin Counties. The travel estimates for the 2007 Community Plan’s preferred Mid-Range Scenario used a network that assumed several key improvements that added capacity to the transportation network by widening existing routes or adding new road segments. These ‘base network improvements,’ some of which were completed, were also used in the 2012 model update. Future projects important to Dublin include: the widening of I-270 from six to eight lanes; Avery Road widening to four lanes south of Shier Rings Road; U.S. 33 widening between I-270 and Avery-Muirfield Drive; Tuttle Crossing Boulevard widening between I-270 and Wilcox Road; Tuttle Crossing Boulevard extension to Houchard Road; Houchard Road widening and northward extension into Union County; and the connection of Emerald Parkway to Sawmill Road. Several roadway networks and land use assumptions were analyzed for transportation impacts to the overall roadway network. The studies identified the benefits and consequences of the various alternatives. In summary, the projects that are needed for the Dublin system to service travel demands include the projects are described as Group I through V, depending on their source and purpose. 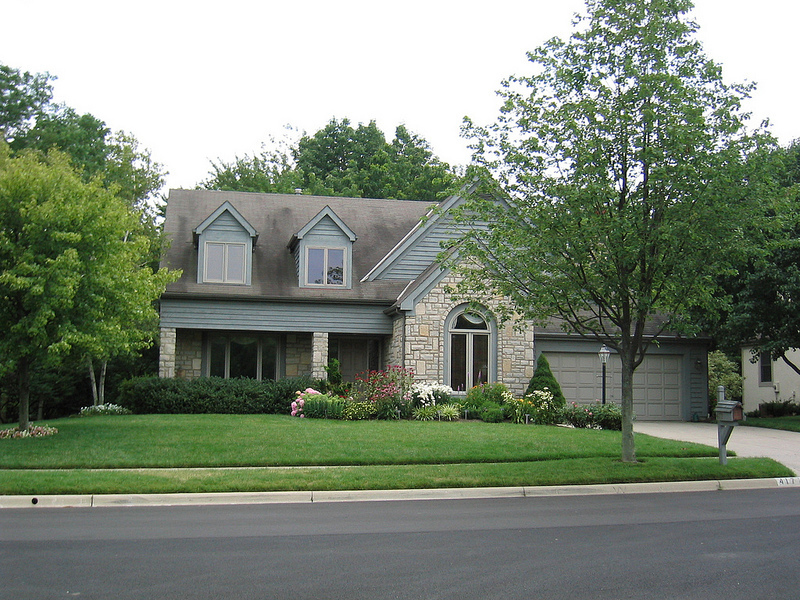 Group I Projects are those recommended projects from the I-270/U.S. 33 Northwest Freeway Study. These projects will draw more traffic to the freeway system and away from the surface street system. In particular, the addition of an interchange with U.S. 33 at Mitchell-Dewitt Road is appropriately located to serve the burgeoning development that will occur in Union County. Traffic results given Dublin’s projected growth are expected to be much worse for Dublin’s arterial system if the freeway and interchange improvements are not implemented. Group II Projects are improvements that will improve mobility within described localized areas. These projects should be strongly pursued in conjunction with development. In particular, the Hyland-Croy Road extension to Home Road (within Jerome Township) is vitally important to mobility for northwestern portions of the modeling area. 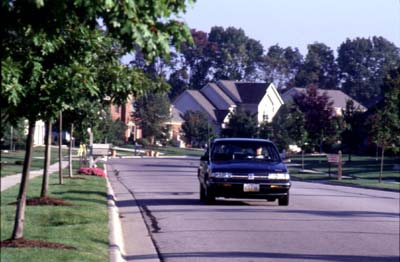 Group III Projects are improvements at various locations due to safety and crash severity concerns such as the Post Road realignment to Commerce Parkway, with Perimeter Drive widened to four lanes from Avery-Muirfield Drive to Emerald Parkway; and the cul-de-sac on Bright Road at Riverside Drive. Group IV Projects are additional improvements resulting from the travel demand analysis. 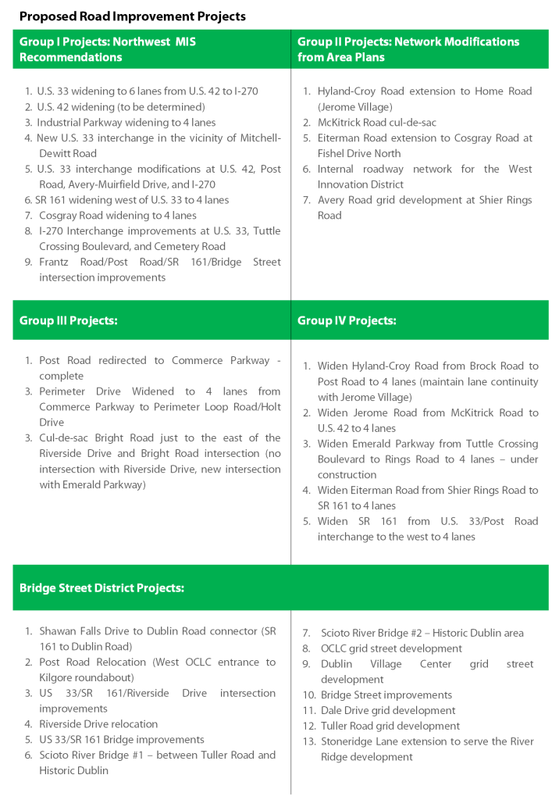 These projects benefit the performance of the overall Dublin area and have significant impacts on their immediate areas. Group V Projects are improvements that create a grid street network in the Bridge Street District and include the possibility of a new 2-lane bridge crossing the Scioto River. These projects and streetscapes create a truly multi-modal transportation system by including amenities to support transit ridership, pedestrians, and cyclists. Peak hour levels of service (AM and PM) on the Thoroughfare Plan network were analyzed as part of the travel demand model. When all of the improvements from the five project groups are combined, the travel demand model shows that traffic (as intended by design) is drawn to the widened roads; the widening of U.S. 42 and Hyland-Croy Road and the extension of Hyland-Croy Road increases traffic on these roadways. These improvements enable traffic reductions on adjacent roads such as Avery Road and Muirfield Drive. The greater development densities planned for the Bridge Street District created the need to rethink the transportation network not just within the Bridge Street District but for the entire network. The planned grid street network in the District is expected to improve traffic operations by giving travelers more transit, bike, and walking choices, and interconnected through-streets to disperse traffic across numerous roadways. Due to the interconnectivity of the grid street network, an additional bridge* connection, the emphasis on multi-modal travel, and the high density, mixed –use development pattern, modeling results indicate the potential for up to a 40 percent internal ‘capture rate’ of vehicle trips, meaning that 40 percent of trips will remain within the District and/or will be made using something other than an automobile (e.g. walking, biking or transit). *A new bridge is included in the roadway network between SR 161/Bridge Street and the I-270 overpass that will serve to provide additional connectivity within the District; however, modeling suggests that this bridge will not significantly affect traffic volumes on SR 161/Bridge Street. A level of service (LOS) system is used to characterize those driving conditions that motorists routinely experience and recognize; how long is a vehicle stopped at a traffic signal, or how slow is traffic moving. The LOS is a rating system for roadways that measures these traffic conditions and motorists’ perceptions. The individual LOS is described by factors such as speed and travel time, freedom to maneuver, traffic interruptions, and driver comfort and convenience. Six LOS categories are commonly defined by a letter designation from “A” to “F,” similar to a report card, with LOS “A” representing the best operating conditions and LOS “F” depicting the worst. “A” is the best operating condition with a free flow in which there is little or no restriction on speed or maneuverability. At intersections, there is little or no delay. “B” represents a condition of stable traffic flow, but speeds are slower. Short traffic delays occur at intersections. “C” is still a condition of stable flow, but most drivers are less able to drive at the speeds at which they feel comfortable, and find it difficult to change lanes or pass other vehicles. Intersections experience average traffic delays. “D” approaches unstable flow. Operating speeds are tolerable to the driver, but are subject to considerable and sudden variation. Freedom to maneuver is limited and driving comfort is low, as the probability of accidents has increased. Long traffic delays are experienced at intersections. “E” represents a maximum roadway capacity for vehicles. Traffic is unstable, speeds and ease of driving fluctuate, and drivers have little ability to select speed or maneuverability. Driving comfort is low and accident potential high. Vehicles are close together and speeds can fluctuate quickly. Very long traffic delays are experienced at intersections. “F” is the worst operating condition. Speed and rate of traffic flow may drop to zero for short time periods. Extreme delays are experienced at intersections. This may cause severe congestion, affecting other adjacent roadways. LOS “A” through “C”: V/C is less than 77 percent; i.e. the roadway is carrying up to 77 percent of its capacity. LOS “D”: V/C ranges from 78 percent to 91 percent; the roadway is nearing capacity. LOS “E”: V/C ranges between 92 percent to 100 percent; the roadway has reached capacity and is being utilized to its maximum design. LOS “F”: V/C is greater than 100 percent; traffic now exceeds the capacity of the roadway. As estimated by traffic modeling, AM peak hour traffic the year 2035 AM has volume-to-capacity ratios (see Levels of Service) are generally acceptable. Certain areas will experience high levels of congestion. In some cases this is purposely balancing larger community goals with traffic goals. 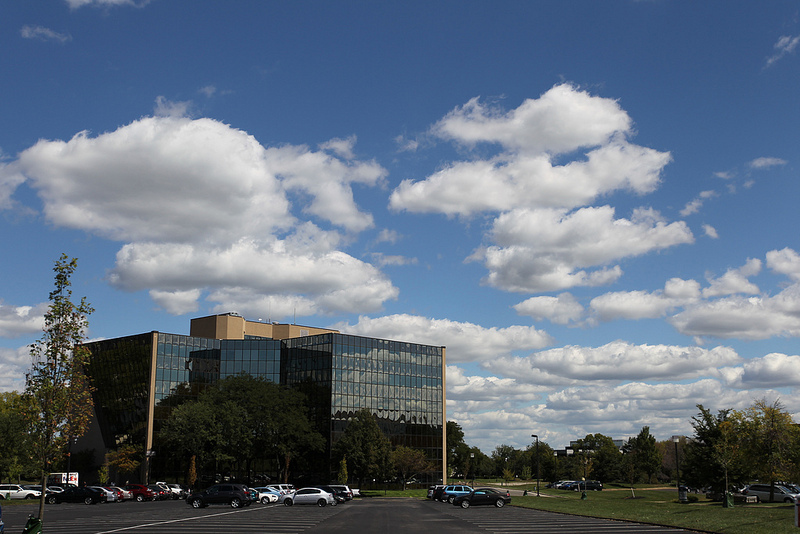 In other locations with low levels of service, corridors provide access to freeways (U.S. 33/SR 161 and I-270) and service the business corridors with significant concentrations of employment. High congestion levels are projected in the southbound direction on Dublin Road south from Memorial Drive through the Historic Dublin to Rings Road. 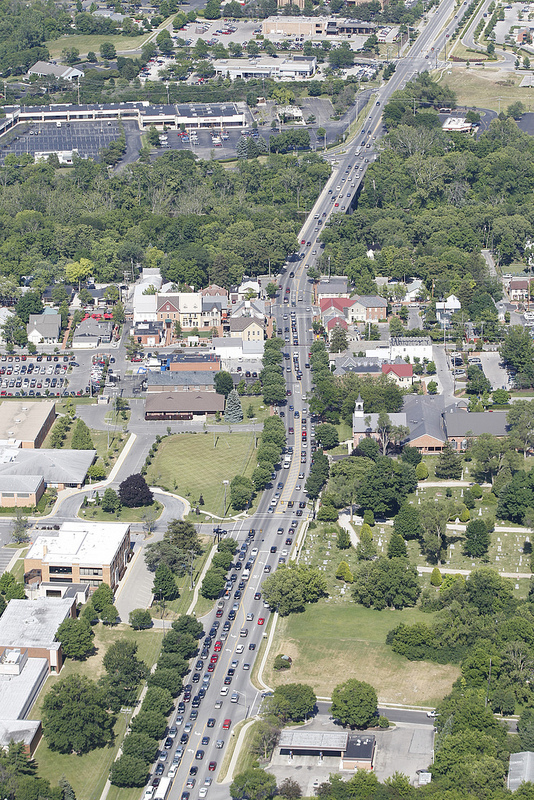 A policy decision was made to preserve the character and number of lanes on existing Dublin Road to maintain its historic qualities and quality of life to the residents who travel this roadway. Coffman Road between Brand Road and Emerald Parkway and Emerald Parkway from Coffman Road to Perimeter Drive are projected at LOS “F” in the southbound direction during morning rush hour. The intersection of Brand and Coffman Roads is also LOS “F” for the morning peak hour indicating the need for intersection improvements at this location. The Avery-Muirfield Drive corridor also exhibits LOS “F” for southbound traffic. 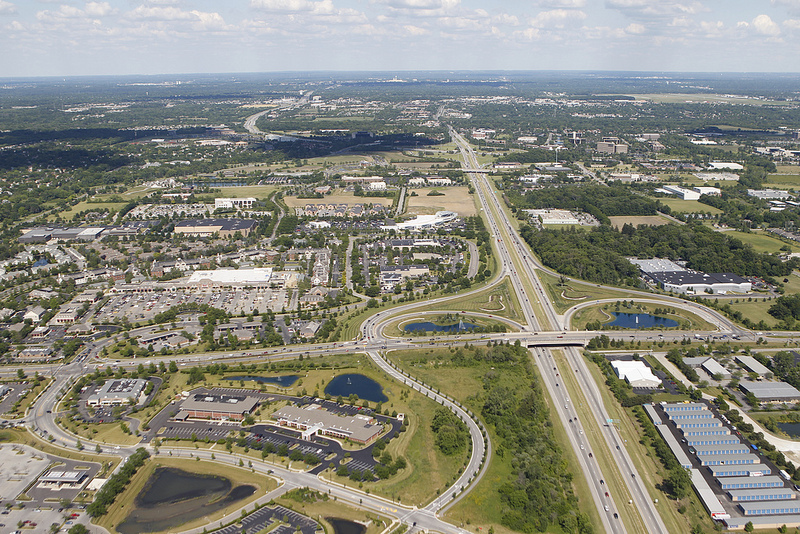 The U.S. 33/SR 161 interchange, combined with commercial development along the corridor, provides traffic volumes that challenge the existing 4/5 through lane configuration. Even if an additional through lane was added in each direction there would still be poor service levels. Intersection improvement projects should help, but not solve, congestion along the roadway and at the intersections with Perimeter Drive and Perimeter Loop Road. The U.S. 33/SR 161 westbound ramp intersection is also LOS “F” in the AM, while the Perimeter Loop Road and the Perimeter Drive intersections are in the LOS “D” range. Avery Road south of U.S. 33/SR 161 modeled as LOS “E” in the AM southbound peak hour. 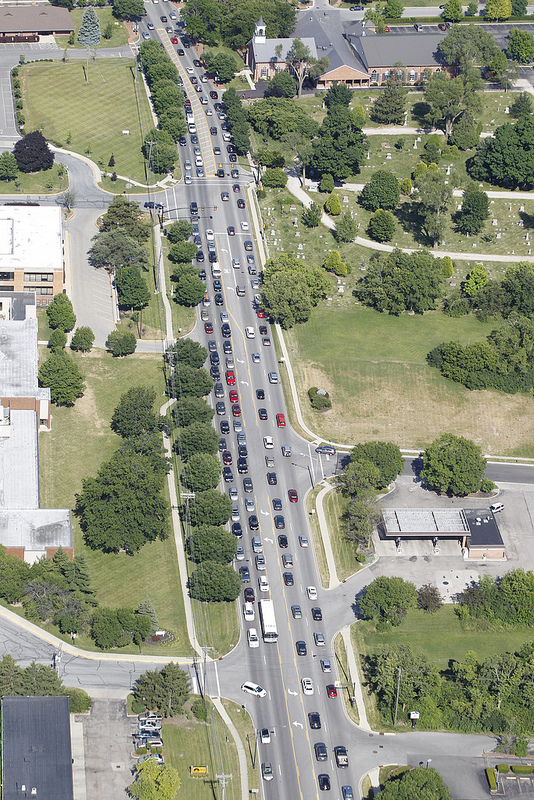 Improvements to the intersection of Avery Road and Woerner Temple Road are also needed by 2035 to address congestion. 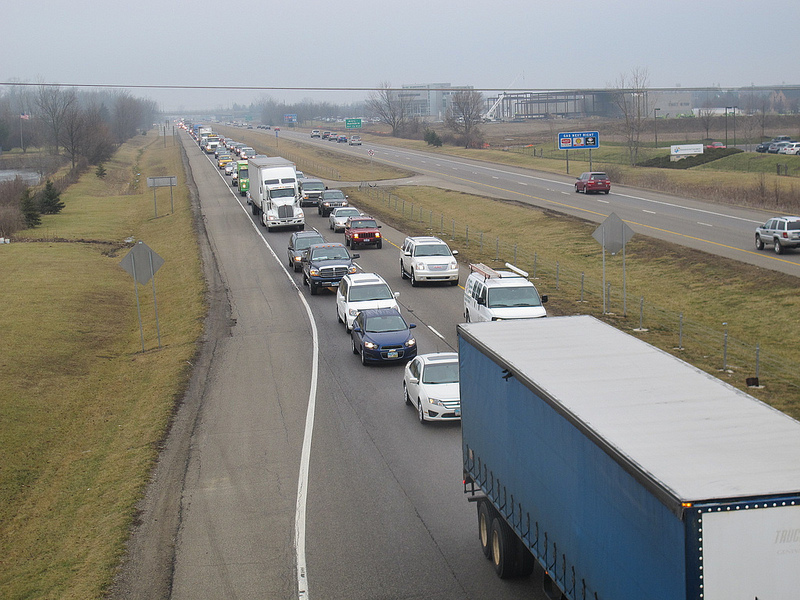 Non-freeway sections of U.S. 33/SR 161 from Frantz Road to Dublin Road carry a high volume of traffic during the morning commute. This corridor along with Frantz Road, services many higher density employment and residential destinations in Dublin, including Metro Center. In the year 2035, other congested intersections include Emerald Parkway at Post Road; Post Road/Frantz Road and SR 161 (inside I-270); Riverside Drive at SR 161; and Bridge and High Streets in Historic Dublin. While not surprising, modeling results indicate the need for system upgrades. Based on the transportation analysis completed for the Bridge Street District, significantly expanding the size of the intersection of Bridge Street at High Street will not help ease congestion from future regional growth; a pedestrian-scaled intersection, however, will preserve walkability while acting as a deterrent to some regional trips with no real effect on congestion. During the 2035 PM peak hour, volume-to-capacity ratios for network links as expressed in terms of levels of service are generally acceptable; however, the PM peak hour typically experiences poorer levels of service than the AM peak. High congestion levels are projected in the southbound direction along Dublin Road south from Memorial Drive through the Historic District to Rings Road. 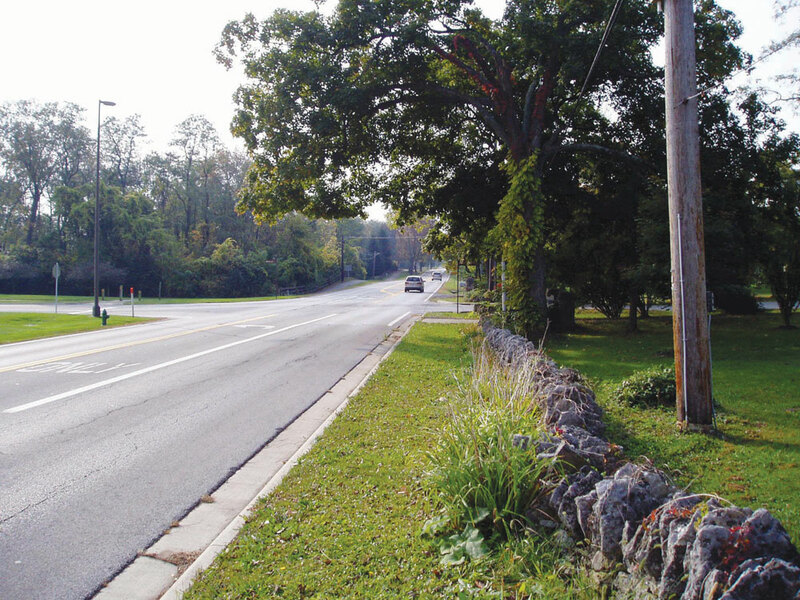 A policy decision was made to preserve the character and number of lanes on existing Dublin Road to maintain its scenic and historic qualities and quality of life to the residents who travel this roadway. Coffman Road from Brand Road to Emerald Parkway and Emerald Parkway between Coffman Road and Perimeter Drive exhibit LOS “E” and “F” congestion in the northbound direction during the afternoon rush hour. The intersection of Brand and Coffman Roads is in the LOS range “A-C” in the PM peak hour. The Avery-Muirfield Drive corridor also exhibits LOS “F” for the link in the northbound direction. The U.S. 33/SR 161 interchange, combined with commercial development along the corridor, provides traffic volumes that challenge the existing 4/5 through lane configuration. Even if an additional through lane was added in each direction there would still be poor service levels. As in the AM, intersection improvement projects are anticipated to ease, but not totally solve the situation along road segments at the intersections of Perimeter Drive and Perimeter Loop Road. The U.S. 33/SR 161 west bound off ramp and the Perimeter Loop Road intersections were modeled at a LOS “F”. Avery-Muirfield Drive at Perimeter Drive operates at LOS “E”. Avery Road south of U.S. 33/SR 161 to Tuttle Crossing Boulevard also exhibits poor service, with a LOS “F” in the PM peak hour in both the north and south bound directions. Improvements to the intersection of Avery Road at Woerner Temple Road are needed by 2035 to address congestion. The non-freeway section of U.S. 33/SR 161 from Frantz Road to Dublin Road carries high traffic volumes during the PM peak hour. 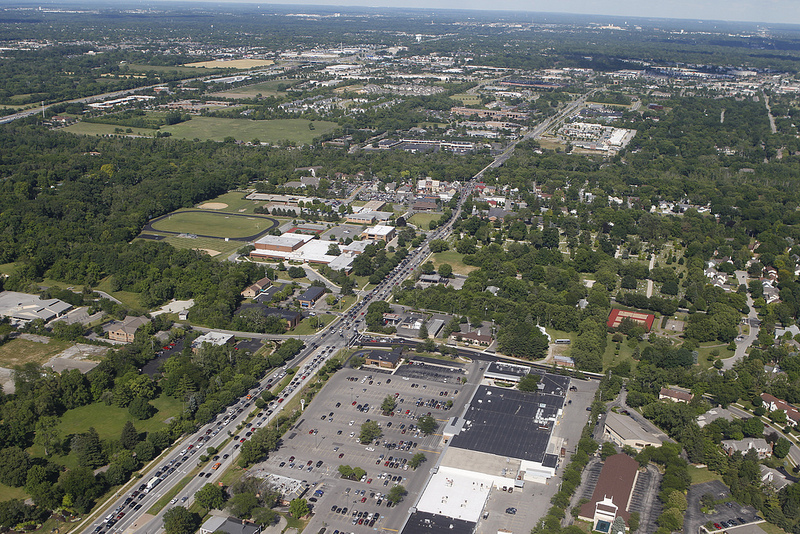 This corridor along with Frantz Road, serves many higher density commercial and residential destinations in Dublin. Motorists using Frantz Road from U.S. 33/SR 161 to Rings Road also will experience heavy LOS “F” congestion in the future PM peak hour. In the year 2035, other congested intersections will include: Post Road/Frantz Road and SR 161 (inside I-270), Bridge and High Streets in Historic Dublin, Riverside Drive and SR 161, and Emerald Parkway and Riverside Drive. As stated earlier, based on the transportation analysis completed for the Bridge Street District, significantly expanding the size of the intersection of Bridge Street at High Street will not help ease congestion from future regional growth; a pedestrian-scaled intersection, however, will preserve walkability while acting as a deterrent to some regional trips with no real effect on congestion. The low levels of service for the PM peak hour are nearly the same as those corridors in the AM peak period, generally in the reverse direction, and are those located along freeways (U.S. 33/SR 161 and I-270), and in major commercial areas.